Note: This information is for guidance and reference only. A decision on your admissibility can only be made when you apply to come to Canada or at a port of entry. Some people are not allowed to come to Canada. They are known as “inadmissible” under Canada’s Immigration and Refugee Protection Act (IRPA). If you have committed or been convicted of a crime, you have a few options. If you have been convicted of driving while impaired by alcohol or drugs, you will probably be found criminally inadmissible to Canada. More detailed explanation of the reasons for inadmissibility. Normally, if you are inadmissible to Canada, you will not be allowed to enter. If you have a reason to travel to Canada that is justified in the circumstances, you may be issued a temporary resident permit. The table below explains when a person may be deemed rehabilitated and is eligible to apply for parole. For details on how to overcome criminal inadmissibility see the chapter at the bottom of this page. People can be denied a visa, refused admission or removed from Canada for a number of reasons. They have engaged in, or there are reasonable grounds to believe they will engage in, spying, subversion or terrorism, or they belong to organizations that have engaged in, or will engage in, these activities. They have committed war crimes or crimes against humanity. They are or were senior members or officials of a government that has committed acts of terrorism, major human rights violations, genocide, war crimes or crimes against humanity. They have, or there are reasonable grounds to believe they have, committed a crime punishable by a maximum of 10 years of incarceration. They have, or there are reasonable grounds to believe they have, committed an indictable crime. They commit an offence such as possessing or importing narcotics, while seeking entry to Canada. They belong to an organization that is believed to take part in organized criminal activity or to engage in transnational crimes such as people smuggling, trafficking in people or money laundering. They may be a danger to public health or cause excessive demands on Canada's health or social services. They are unable or unwilling to support themselves and their dependants. They provide officers with false information or withhold information that is directly relevant to a decision under the Immigration and Refugee Protection Act (IRPA). breaching conditions imposed when they were first admitted to Canada. They are the family members of someone who is inadmissible. In addition, permanent residents are in breach of IRPA if they fail to meet the residency obligations set out in the Act. Permanent residents who are inadmissible for this reason may be issued removal orders. In some cases, the CBSA has the power to issue removal orders directly; that is, to send the person out of Canada, without requesting an admissibility hearing. When the CBSA requests an admissibility hearing, it also sends the IRB a report. The report explains why it believes the person should not be allowed to enter or remain in Canada. This information is intended for general guidance and reference only. A legal decision on your inadmissibility can only be made at the time you seek entry into Canada either through an application or at a port of entry. you have obtained a temporary resident permit. You may be deemed rehabilitated if you meet the requirements of the Immigration and Refugee Protection Act. Depending on the nature of your offence, at least five years and as many as 10 years must have passed since you completed the sentence imposed for your crime. Deemed rehabilitation also depends on whether you have committed one or more offences. In all cases, you may only be deemed rehabilitated if the offence committed would be punishable in Canada by a maximum term of imprisonment of less than 10 years. You are not required to submit an application to be deemed rehabilitated. However, before arriving at a port of entry, we strongly advise you to contact a Canadian embassy, high commission or consulate outside Canada to see if you qualify. Rehabilitation means that you lead a stable life and that you are unlikely to be involved in any further criminal activity. If you want to come to Canada but you have committed or been convicted of a crime and you are not eligible for “deemed rehabilitation,” you must apply for rehabilitation to enter Canada. To apply for individual rehabilitation, at least five years must have passed since you completed all your criminal sentences. You must submit an application to the Canadian visa office in your area and pay a processing fee. Please note: Applications for rehabilitation can take over a year to process, so make sure you plan for your visit far enough in advance. If you have been convicted in Canada and wish to apply for a pardon, see the National Parole Board website. If you received a Canadian pardon for your conviction, you may be allowed to enter Canada. If you received a pardon or a discharge for your conviction in a country other than Canada, check with the CIC office closest to you for more information. If less than five years have passed since the end of the criminal sentence, or if justified by compelling circumstances, foreign nationals who are inadmissible to Canada, including people who have a criminal conviction, may be issued temporary resident permits allowing them to enter or remain in Canada. Note: Temporary resident permits are only issued in exceptional circumstances, if there are reasons of national interest or strong humanitarian or compassionate grounds. A temporary resident permit may be cancelled at any time. If you are applying for a temporary resident visa or a permanent resident visa, you will have to provide details of your criminal history in your visa application. In cases where you have been declared criminally inadmissible, you may apply for rehabilitation if the required five years have elapsed since your conviction. Read the Frequently Asked Questions for more information on criminal inadmissibility. Under Canada’s Immigration and Refugee Protection Act, temporary residents and applicants for permanent residence in Canada may not be able to come to Canada if they have been involved in criminal activity. This guide explains when people might be considered inadmissible and under what conditions they can apply to overcome the inadmissibility. Are you inadmissible because of past criminal activity? Note: In order to determine inadmissibility, foreign convictions and laws are equated to Canadian law as if they had occurred in Canada. Have you been charged, discharged or pardoned? * You must provide an officer with complete details of charges, convictions, court dispositions, pardons, photocopies of applicable sections of foreign law(s), and court proceedings to allow the officer to determine whether or not you are inadmissible to Canada. If pardoned under the Criminal Records Act in Canada, you are not inadmissible. you were convicted in a country which does not have special provisions for young offenders but the circumstances of your conviction are such that you would not have received an adult sentence in Canada. you were convicted in adult court in a country that has special provisions for young offenders. you may be deemed to have been rehabilitated if at least ten years have passed since you completed the sentence imposed upon you, or since you committed the offence, if the offence is one that would, in Canada, be an indictable offence punishable by a maximum term of imprisonment of less than ten years. If the offence is one that would, in Canada, be prosecuted summarily and if you were convicted for two (2) or more such offences, that period is at least five (5) years after the sentences imposed were served or to be served. if prosecuted by indictment is five (5) years. if punishable on summary conviction is three (3) years. Once you have a copy of the pardon, send a photocopy to a Canadian visa office or Citizenship and Immigration Centre. If you are travelling to Canada carry a copy of the pardon with you. you have had no other convictions. 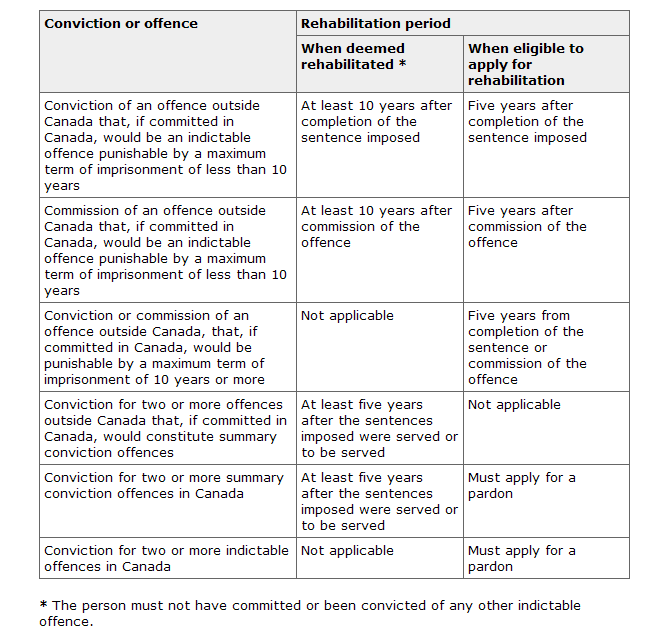 See the table at the beginning of this page for a summary of the type of offences and length of rehabilitation periods. If you have convictions in Canada and convictions/offences outside of Canada, both an approval of rehabilitation and a pardon are required to overcome your inadmissibility. Note: Your request for rehabilitation cannot be made until you have first obtained a pardon, except if you have only one summary conviction in Canada. In such instances, you may submit an application for rehabilitation for any convictions/offences outside Canada if you can provide evidence that you have submitted an application for a pardon to the National Parole Board. Rehabilitation removes the grounds of criminal inadmissibility. Rehabilitation means that you lead a stable lifestyle and that you are unlikely to be involved in any further criminal activity. Are you eligible to apply for rehabilitation? been convicted outside of Canada and five years have passed since the end of the sentence imposed. As there are different types of sentences, use the following table to calculate the five-year waiting period. *You are prohibited by the Criminal Court from driving. Determining the Eligibility Date: Count five years from the date of sentencing. Determining the Eligibility Date: Count five years from the date the fine was paid. In the case of varying payment dates, the rehabilitation period starts on the date of the last payment. Determining the Eligibility Date: Count five years from the end of the term of imprisonment. Determining the Eligibility Date: Count five years from the completion of parole. Determining the Eligibility Date: Probation is part of the sentence. Therefore, count five years from the end of the probation period. Determining the Eligibility Date: Count five years from the end date of the prohibition. Example 1: I was convicted of a crime on December 13, 2002, and received a jail sentence of three months. When will I be eligible to apply for rehabilitation? You can apply for rehabilitation five years after the end of the sentence imposed. If your three-month jail sentence ended March 13, 2003, you are eligible to apply for rehabilitation on March 13, 2008, as long as no other terms were imposed on your sentence. Example 2: On June 3, 2003, I was convicted of driving under the influence and had my driver’s licence taken away from me for three years. When am I eligible to apply for rehabilitation? The sentence imposed ends on June 3, 2006. Count five years from the end date of the suspension or the date your driver’s licence is reinstated. You will be eligible to apply for rehabilitation on June 3, 2011. Example 3: I have one conviction for which I was given three years of probation. Do I apply for rehabilitation after my probation is finished? No. You are not eligible for rehabilitation until five years after the end of the sentence imposed. Since probation forms part of the imposed sentence, you can apply for rehabilitation five years after you complete your probation. If you need to come to Canada, but cannot apply for rehabilitation because five years have not passed since the end of the sentence imposed or you are not eligible to apply for a pardon for convictions in Canada, you may ask an officer for special permission to enter or remain in Canada. Complete the Application for Criminal Rehabilitation, but check the box that states, “For Information Only.” Attach the documents outlined in the Document Checklist. *There will be processing fees for applications for special permission to come into or remain in Canada. You will be advised of the processing fees at the time, or you can refer to our website for further details. advise that you could apply for special permission (temporary resident’s permit) to enter Canada*. advise that you could apply for special permission (temporary resident’s permit) to remain in Canada*.